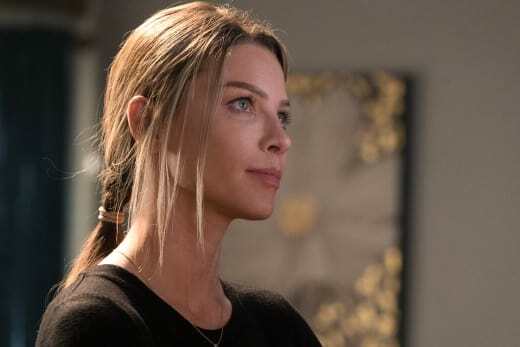 On Lucifer Season 2 Episode 14, Lucifer finally comes back home, but surprises everyone with who he brings with him. Yes. It's true. Lucifer got married in Vegas. After that special kiss with Chloe on Lucifer Season 2 Episode 13, you'd think his heart would be aching after being away from her for so long. Apparently not, because Lucifer found a new love with an exotic dancer named Candy. As it turns out, he only "married" Candy to protect Chloe from himself. He really didn't want to end their romantic relationship, but because it was something designed by dad, he felt it necessary. Chloe was a pawn to his dad's game as much as he was so he felt the only way to protect her was to put something...or someone between the two of them. Chloe was definitely floored when Candy showed up on Lucifer's arm. It must've been a punch to the gut when he announced he was married. Lucifer being Lucifer thought that everything should go back to normal now that he was back. He didn't quite understand how much he hurt Chloe by leaving and how much he hurt her now by showing up with another woman. The separation between Chloe and Lucifer isn't going to last long. It's obvious Chloe still cares for Lucifer which is to be expected. Lucifer still cares for Chloe otherwise he wouldn't have come up with this ridiculous plan to protect her. The interaction between them this hour was hilarious. Chloe can't let her anger and disappointment over Lucifer's actions go. When she was interviewing suspects, she brought Lucifer into the conversation without really bringing him into the conversation. Didn't you love when Dan and Lucifer were watching her question the ex-wife and Lucifer thought she was talking about Dan? At least Dan knew what was going on. As much as Dan would like to get back together with Chloe, he knows that ship sailed. It was very thoughtful of him to step away from the case and let Lucifer get back into the game. He realized it's what Chloe really wanted even though she didn't necessarily say so. So, Dan making that sacrifice says something about how much he truly cares for her. Still, it has to be killing him to know that there's no longer any hope for them as a couple, but I really do admire him putting Chloe first. As loony as Candy was, she was a great addition to the show. I wonder what Lucifer did to save her life? I'm guessing she was in some sort of drug problem. But maybe it had to do with the silver case from the beginning of the hour? Maybe Lucifer was paying to get Candy away from her exotic dancing life, but why the silver case. Either way, Candy did a fabulous job faking everyone out. In the end, she wasn't all ditzy. And they really didn't get married. It was all a ruse. How is Lucifer going to explain away Candy's leaving? Dr. Linda's reaction to Candy was classic Dr. Linda. She didn't quite understand what Lucifer was thinking. I loved when she tried to correct Candy with "indispensable" when Candy said "expandable," but Candy knew what she was talking about. The best part of the hour was when Chloe played Candy to try and nail the divorce mediator. The things Chloe will do to get the job done and the banter between them was great. When Chloe showed up at the club, she really thought Lucifer was talking about her, until he brought up Marla to the stage. Poor Chloe for being so embarrassed, but how touching when she learned that he really was singing about her. Yeah, these two are going to get back together sooner rather than later. 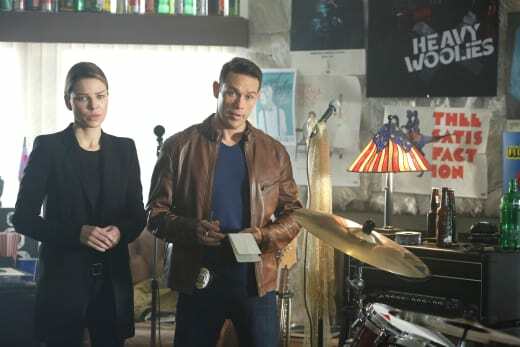 And while it may be later romantically, at least we'll be seeing Chloe and Lucifer continue to work together. As it should be. They really do need to spend some time with Dr. Linda as a couple. Can you imagine how great that would be? Charlotte trying to manipulate Candy was interesting. I loved how frustrated she got when she couldn't find out the information she thought she should have. Candy did a great job confusing Charlotte. She did exactly what she was supposed to be doing. Maze recognizing Chloe was jealous. I love how everyone is rooting for Chloe and Lucifer, but I'm glad there is a separation. We don't want a curse to befall the show, do we? Amenadiel reading Lucifer the riot act. He deserved it and it forced him to realize what he was doing with Candy was to protect Chloe. I still don't trust Charlotte. Why does Amenadiel? What did you guys think about "Candy Morningstar"? Hit the comments and share your thoughts! 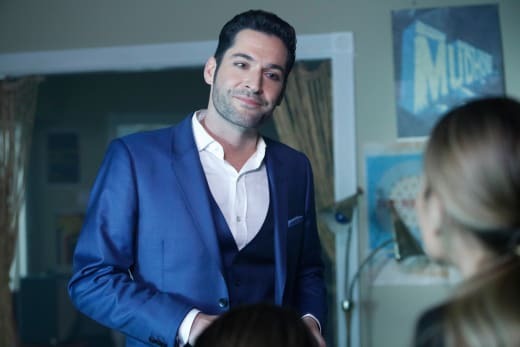 If you need to catch up, you can watch Lucifer online right here via TV Fanatic! That's exactly what we are, just friends. Permalink: That's exactly what we are, just friends. I miss Lucifer. He was the best hugger. All squirmy on the outside but warm and fuzzy on the inside. 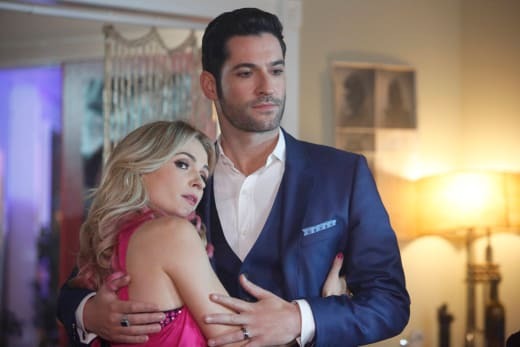 Lucifer Photo Preview: A Wedding Ring? !